Youngsters picking out prizes they have won. Those iconic three words, “Come on down!” echoed inside the Windham High School Performing Arts Center over and over - complete with the show’s theme music last Friday. The game show, “The Price is Right” took to the stage in an effort to raise money in support of Project Graduation 2017; a project in which all the seniors and their parents got together to raise money. “Karen Petcher, Windham High School (WHS) math teacher, came up with the idea of ‘The Price is Right’ from a town she grew up in, so she pretty much ran everything that went on tonight,” explained Robin Mullins, co-chair for the Windham High School class of 2017 Project Graduation. WHS has been doing projects like this for as long as Mullins can remember. “As a graduate of the high school in 1986, they had similar projects, but it wasn’t quite the same. We paid for it as a class and it was a little cruise around Casco Bay. This year will be something really special.” Usually kept as secret, students will not know what it is until graduation day. Keeping it a secret requires great willpower. “My daughter is graduating and I can’t even tell her, although several attempts have been made,” continued Mullins laughingly. “We have to raise $30,000 for the trip and I am pretty sure that we are not only going to meet that goal but exceed it,” stated Mullins. A year is all that Project Graduation committees have to raise funds because fundraising efforts cannot begin until the previous class is done with their projects. “So you literally have about nine to 10 months: plenty of time when parents contribute,” continued Mullins. “I think we have a really good group of kids and parents. If anything is needed they have been stepping up.” To this end Kudos also went to class advisor Kelly Anne Rush. It was also her respect for producer Karen Petcher that prompted her participation. “Mrs. Petcher is putting this on and she is a great lady,” Noonan explained. “I wanted to support my class. I like to volunteer for most of the things for my class. I think it is important.” Noonan also credited her success to the school system. In all, there were eight games played. Two wheel segments, with the top winning contestants and, the cream de la crème, the showcase showdown. In between each of the eight games, the names of five children over the age of eight were called out. Excitement and applause ensued as they ran to a separate table where they could take a prize of their choice. While there was a sign held up during the event to encourage applause, clearly it was wasn’t necessary, right up until the very end. Obviously enjoying her first ever attendance of a show like this, Debbie Payne who walked away as the overall winner of the evening, took home the coveted showcase, a five-night stay for a family of four at Point Sebago, a tube to be pulled behind a boat, two beach chairs, a cooler, S’more snacks, two beach towels, and a remote controlled boat. “I was really excited about winning,” said Payne. Battling through a bit of nerves, she managed to make the bid without going over, but not before also scoring a few raffle drawings earlier. If there is another show again next year Payne will be there. “I absolutely will be back again,” she confirmed. There were 150 donating businesses, encompassing most of Cumberland County that also made this event possible by providing the prizes. All of them that were not won, including the showcase, were raffled off at the end of the show. All proceeds from admission, concession and raffles will be applied to the project’s goal. “We are pretty close to hitting our goal right now so we are sure it will be exceeded from this night and the upcoming events,” shared Mullins. Two more events are on tap with Project Graduation. One is Smitty’s Movie Night on April 13. As Mullins explains, “People basically receive a ticket. When they go to the movies the theater will receive $5 and we will receive $5. So it is pretty easy. All we do is hand out the tickets.” The other event is a Fun Run/Walk-5k and takes place on April 30. Anything over and above the target goal of $30,000 will be donated to charities in the names of two students who will not be present. “There was a student who passed away while in fifth grade and another one more recent. Both would have been seniors this year. They’re in our hearts,” concluded Mullins. FMI on movie night visit: www.facebook.com/events/379385719095795/ and look in this or a future issue of The Windham Eagle for a coupon to clip out. It is without a doubt that the tangible benefits of studying science and math are irrefutable. The training in these subjects provides students with a future of high employability and skills that will not only benefit the individual but society as well. However, in the pursuit of our need to compete and improve in these areas, the often overlooked and intangible benefits of art are just as undeniable and should not be ignored. 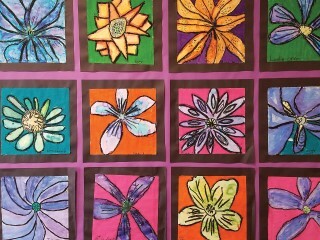 In a 2007 Commencement Address at Stanford University, poet and national endowment for the Arts Chairman, Dana Gioia, stated, “Art is an irreplaceable way of understanding and expressing the world. There are some truths about life that can be expressed only as stories, or songs, or images. Art delights, instructs, consoles. 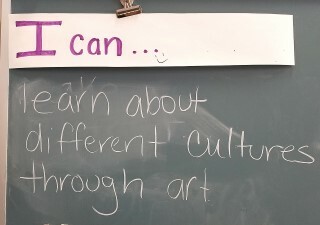 It educates our emotions.” Various neuroscience studies indicate that a child’s participation in the arts can have a profound effect on the brain's cognitive, social and emotional development and introduces children to different cultures, creating fully functioning and well-rounded individuals. 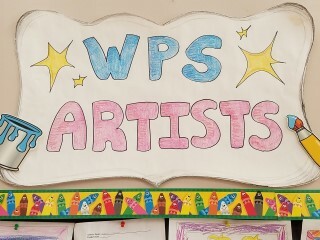 On my recent visit to Windham Primary School, the third grade students in Vasiliauskas’ class and the first and third grade students in art teacher Kirsten Hackett’s class, were busy creating various works of art. The projects contained a certain level of detail, creating a spark, a purpose and the ability to follow through, that contributes to a child’s confidence. Vasiliauskas also recommends other ways to incorporate art in a child’s everyday life; ideas such as a family art night. “You can have a crazy sculpture competition using simple materials like paper towel rolls and pipe cleaners, take out a book on origami and try it out together or get out some pencils and crayons and have each member draw themselves as a superhero…the possibilities are endless! I think the important thing to remember is that the more you practice, the better you get." Many successful business entrepreneurs have stated that art played a role in their life. Steve Jobs credits a calligraphy writing class to his success. “It was beautiful. Historical. Artistically subtle in a way that science can't capture,” he has been quoted as saying. Ten years after taking that one simple art course, the Macintosh computer was designed. “If I had never dropped in on that single course in college, the Mac would never have multiple typefaces or proportionally spaced fonts,” Jobs has stated. On an evening or a weekend when the busyness of life has subsided and you find your family has a moment of time together without distraction, create a little art. In fact, schedule it in by taking time away from the television and computer. Who knows? That moment of fun and artistic adventure together as a family may just change the world. 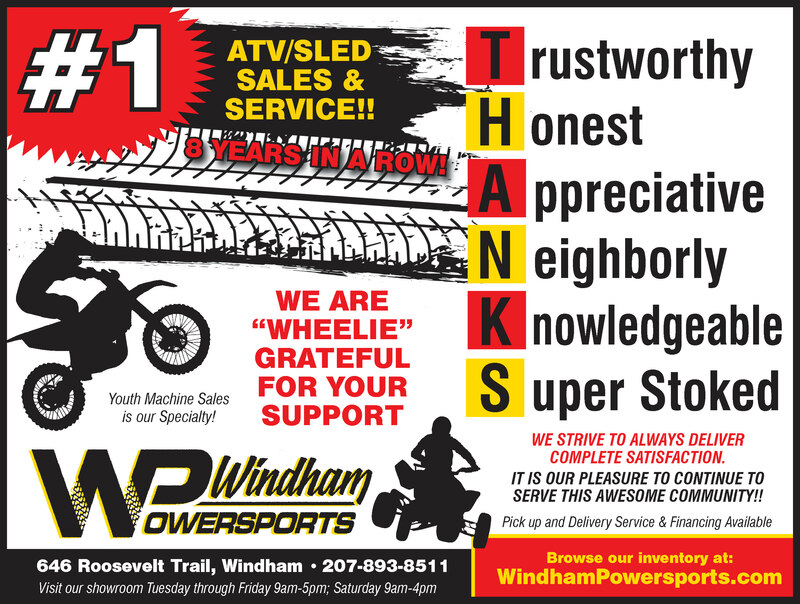 This is the third installment of a series on the history and unique heritage of Windham, then and now. 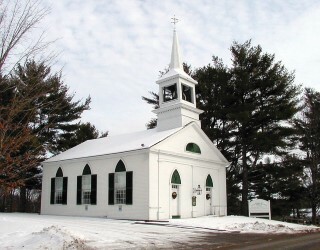 Over its nearly 275 year history, Windham Congregational Church has occupied at least three separate locations, all on high points of land. Whether for protection, circumstance or perhaps a closer talk with thee, the church buildings were constructed on two separate hills (each named Anderson) and on Windham Hill. The denomination holds a distinctive place in the town’s rich history and proud heritage. Local historians record the full or partial construction of no fewer than five churches between 1743 and 1834. In addition to their pioneering spirit, Windham’s early settlers needed certain essentials to achieve their goal of carving a prosperous township out of a barren wilderness: Shelter, food, clothing and (yes, an essential) spiritual nourishment. Attempts to construct a church atop Anderson Hill, off present day River Road, were hindered by hostilities related to the French and Indian Wars. The partially framed edifice was torn down and the timbers used to help construct a fort to protect the early families. Under the pastoral guidance of Rev. John Wight, a 1729 graduate of Harvard College and the township’s first minister, the first services were conducted inside the fort. 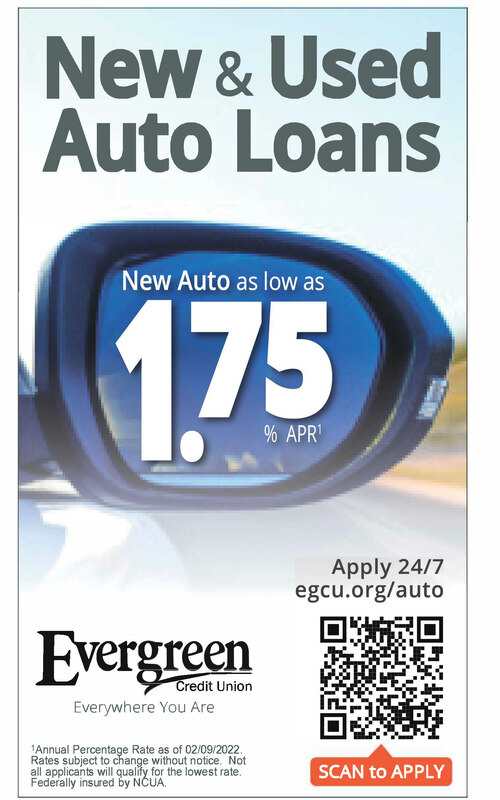 Early records indicate Rev. Wight was highly respected and remembered for his dedication and loyalty to the needs of the infant settlement - a devotion that impaired his health. Wight died in the fort, leaving behind a congregation that grew from seven to 25 members during his tenure. It would be nearly ten years before another minister would lead the parish. In the meantime, hostilities with the French and Indians had ended. Rev. Peter Thatcher Smith, also a Harvard alumnus, was ordained in September, 1762. He preached in the fort until his dismissal in 1790. During Smith’s pastor-ship, two attempts were made to construct “. . . a decent place for the worship of God.” Both were taken down for unknown reasons. Finally in 1795, a meeting house described as, “. . . a very fine edifice for the times,” was built on what was then known as Peter Anderson’s Hill; near the present-day intersection of Webb and Chute Roads. The impressive structure was 50 feet long, 40 feet wide, and two stories high. Upon entering, the visitors’ attention would first be drawn to the elaborately decorated pulpit, perched high above floor level, replete with color and pageantry. The lofty lectern was draped with scarlet cloth, a velvet cushion to support a thick, tattered Bible, and tassels dangling from all four corners. Above the minister’s head, an elaborately carved panel was suspended from the ceiling. Known as a “sounding board,” it acted as an early amplifier, projecting the preacher’s words over the full extent of the sanctuary and beyond. The front hallway featured a glass display case in which the town clerk posted the names of those planning to marry. Called a “publishment box,” it was said to have attracted much attention from the locals. soapstone, heated from home, or a so-called “foot stove” was the only means of warming comfort allowed, even in the depths of winter. The building served Windham’s Congregational community for almost 40 years, until 1834 when construction began on a new church on Windham Hill. 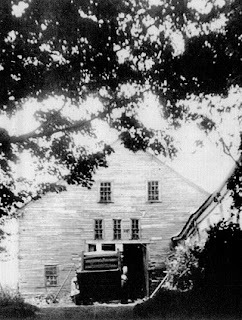 The abandoned building was then used for various public purposes until 1861 when it was partially de-constructed and moved over snowy roads by several teams of oxen to a location on the west side of River Road near the Westbrook line; and then converted into a large barn (pictured here some time before 1959). Many features of the old, formidable church remained, including portions of the original post and beam construction, a wide door and hardware formed by an early blacksmith. Several families used the old, renovated structure well into the 20th century. In 1959 it was razed, the ancient timbers sold and the property cleared to make way for power lines. The newest, and sometimes referred to as the 5th Congregational Church building, was completed in 1835. It was described as “. . . a convenient, well-finished church, with steeple and bell, being the first bell on any church in Windham.” Current church historian Laurel Parker says the bell was cast in Boston by a former apprentice of Paul Revere. The new meeting house was of post and beam construction with Greek Revival, Federal and Gothic features. The steeple is Italianate. A new spire and a weathervane were added in 1885. Long admired for its unique architectural features, the iconic, early New England building earned the church an appearance in a 1935 edition of National Geographic Magazine. A carillon, played from the organ, was installed in 1964 with speakers in the belfry. Instrumental in the construction of the new church was Rev. Jonathon Lee Hale (the 7th settled minister), who did not live to see its completion. One of his successors, Rev. Luther Wiswall, is credited with attaining the church’s greatest prosperity to date. He served for 40 years in the mid-19th century, leaving his home next door to the parish. It would become the parsonage of the First Congregational Church of Windham. The front hall closet once served as a Windham post office. Among the many artifacts of the church’s storied history is a pair of eyeglasses worn by Rev. Wiswall. In 1972, the church was re-named Windham Hill United Church of Christ, Congregational. The church is currently ministered by Rev. Sally Colegrove and is supported by over 200 parishioners. Church leaders honor the church’s history, acknowledging the past and recognizing long time members during Founders’ Day - celebrated yearly. Members of the Sunday School recently painted a time-line of church history in the Faith Education Hallway of Fellowship Hall, located behind the church. Windham Hill U.C.C. raises funds and participates in numerous social and charitable causes, local and worldwide; including support for the Windham food pantry, the Root Cellar of Portland, which helps the homeless, Food & Fellowship for seniors and others, gift boxes for service members and local families, especially during holidays, E-waste collection and the international Heifer Project, which distributes live animals to third-world countries. 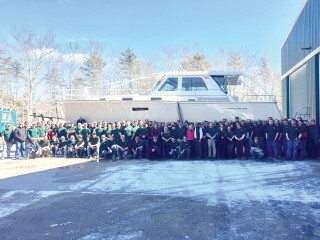 “There are few companies that can say they’ve done what we do,” said Aaron Crawford, president and COO of Sabre Yachts last Thursday, as they rolled out the 100th Sabre Yacht with a 48-foot hull from the facility on the Raymond/Casco line. In a company-wide celebration, with all employees decked out in forest green T-shirts, the owners Randy and Kim Jeffery from Daniel Island, S.C. watched as the newest Sabre Yacht maneuvered out of the driveway and down Route 302, on its way to its new home. “This boat for us is a dream. Every one of you made this boat a reality,” said Randy Jeffery. To commemorate the milestone for the company, Randy and Kim had every employee in the company -150 of them, write their name on a board that was varnished and mounted behind the electrical panel in the boat. So the craftsman would always be with the boat. “You are exactly what Sabre says you are, crafted in the Maine tradition. That’s you,” Randy told the employees gathered for the roll out. The boat will be docked in downtown Charleston. “It’s the Jeffery’s who made this boat possible,” Crawford said. 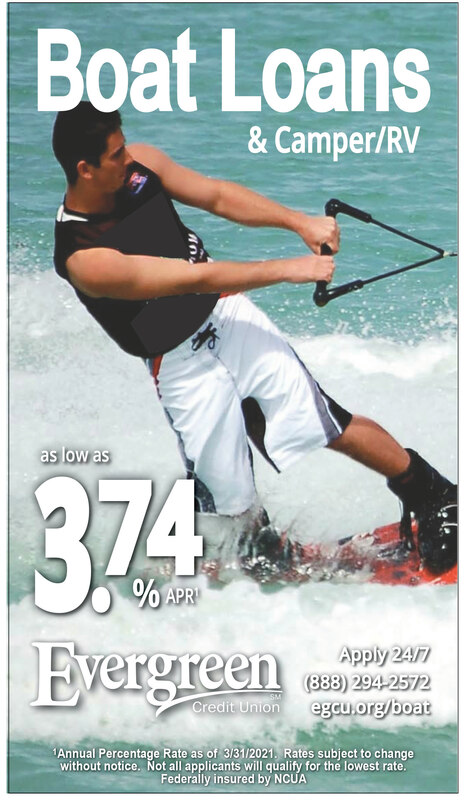 The Jeffery’s upgraded from a 42-foot Sabre boat to the new 48-foot Sabre. Crawford described the owners as very educated and the type of clients Sabre enjoys working with. “It’s our floating condo,” said Kim. “It’s the culmination of all of our boating experiences, and here she is,” said Randy. The Jeffery’s are Mainers in the summer and live in South Carolina in the winter. “The foot yard and the backyard changes,” he added, but everything else stays the same. 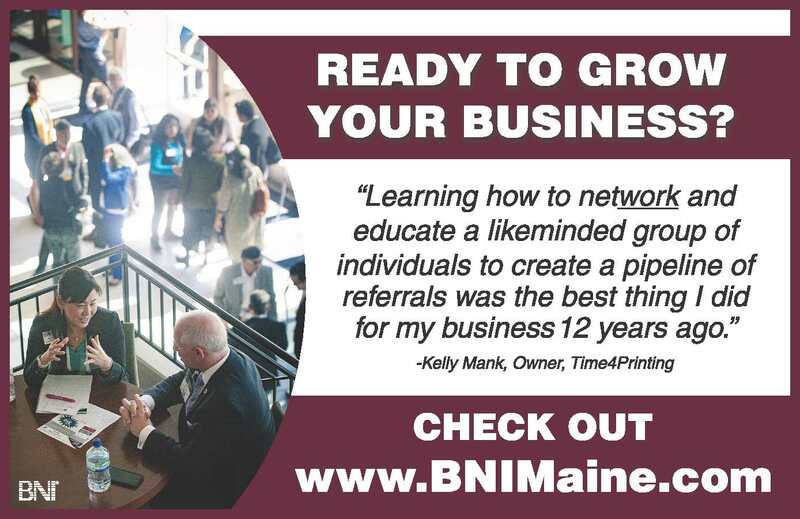 They travel all over Maine in the summer and take trips to Florida and the Bahamas in the winter. During their 37 years together, this is their fifth boat. This boat is the 148th boat that Sabre has shipped from the facility in Raymond. “Boat building is a team sport,” said Crawford. From the high quality building and craftsmanship to sales and marketing as well as customer service and support, it takes the whole team to make the business run smoothly and successfully. Sabre calls itself a semi-custom boat builder and in this economy the purchase of luxury power yachts has remained strong at Sabre. On March 9, I was afforded the opportunity to shadow a Japanese exchange student, who arrived in the United States two weeks ago. 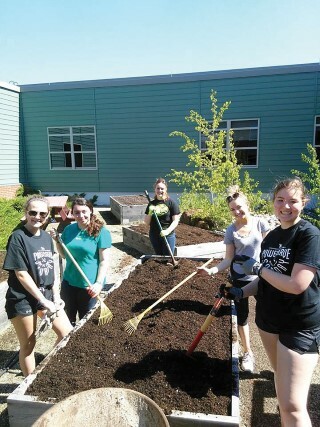 This was part of the ongoing efforts through Greenheart and its dedicated High School Programs Department to connect students with other nations and promote leaders - through a collection of programs and initiatives. Keishi Goya, a 16 year old freshman from Okinawa, was here in the United States for the first time, which is not always the case. Visiting students have a pretty good handle on the English language, but not always. During the first week here, as an introduction to American culture and the education system, all of the Japanese exchange students, and some host parents, went to Boston. “There were also year-long exchange students who attended the trip too, with their host sisters and brothers. They went to Harvard and toured the iconic school with its alumni and also had lunch with them,” shared Skylyn Vokey, a junior at Windham High and President of the International Club. They also got to ask a board of Harvard students questions as well. In addition to Harvard, the exchange students enjoyed a little free time to see some sights. They went to the Old North Church and Quincy Market to which Goya indicated, “I like Quincy Market very much”. But that is just a small difference. In Japan the length of a school day can be as long as 11 hours. “The day starts at 7:30 a.m. and classes end at 4:00 p.m. Then there are mandatory activities and chores like cleaning the school,” continued Goya. With two hours a day of homework on top of that, sleep is at a premium and leaves students tired every day. In addition to long hours the school year is lengthier in Japan. “We start school in April and finish the following March,” shared Goya. Only a one month vacation during the summer and two shorter ones makes vacation seem shorter for them. 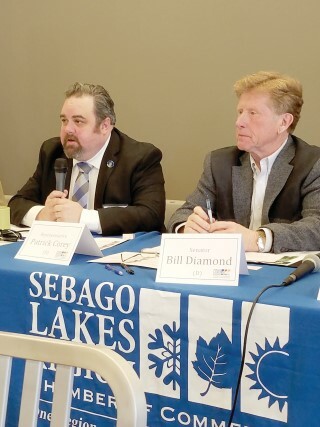 The Legislative Forum presented on Saturday, March 11 by the Sebago Lakes Region Chamber of Commerce (SLRCC) and St. Joseph’s College, was a successful morning of discussions, questions and answers among local business owners and individuals with their Lake Region Delegation. The event began at 10:00 a.m. with networking opportunities among the 45 to 50 local business professionals who attended, followed by respectful and solution focused dialogue from 10:30 a.m. to 12:00 p.m.
Brad Pollard, owner of Cole Farms Restaurant and Pub in Gray, was the first to address the legislative panel, sharing his concern regarding the passage of the Question 4 initiative. 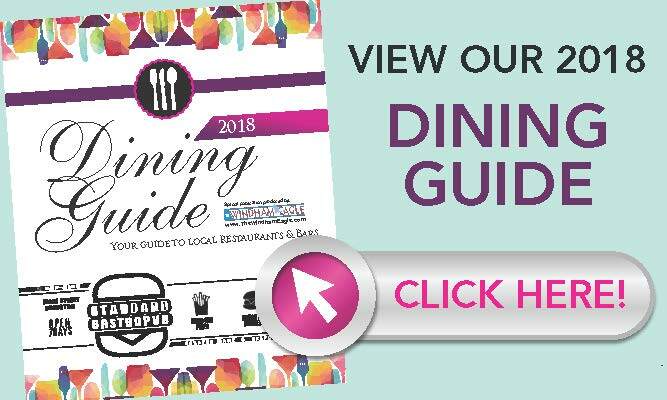 “The minimum wage increase that passed in November will have a devastating effect on the wait staff’s income,” Pollard explained. He stated that if the referendum is not adjusted to accommodate servers, they will soon see a wage decrease. Pollard further explained that it is the tips they rely upon for the bulk of their income and is what allows them to support their families. With the referendum as it stands now, the decrease in tips will have detrimental effects on the quality of their lives. 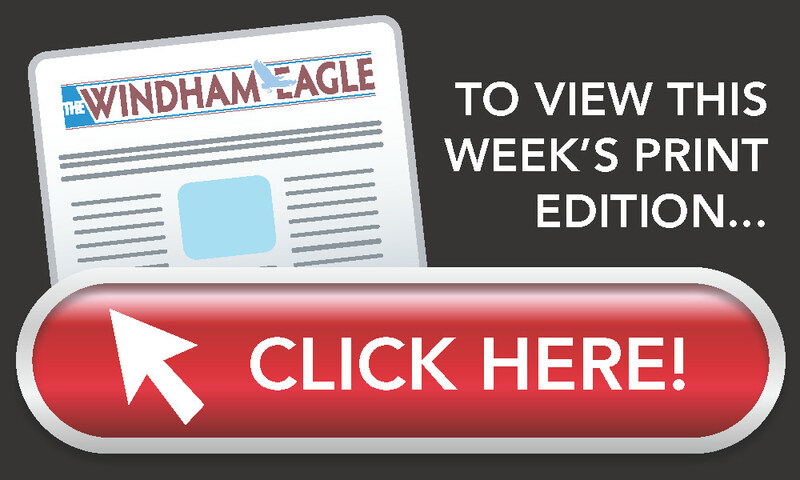 Dave Pollard, co-owner of Spring Meadows Golf Club in Gray expressed his concern regarding the expansion of the sales tax to recreational businesses. He explained to the panel that 70 percent of his customer base comes from hardworking Mainers who do not have a lot of disposable income. The tax increase will demand that he increase green fees, which he has not done in eight years. Dave Pollard also stated that, although he understands the need for controlled pesticides, the bills that limit pesticide use, influences the course itself. He reminded the panel that golf courses have trained professionals who apply the pesticides. Other concerns and issues expressed by attendees included: the 3 percent surtax due to the passage of the Question 2 initiative, the legalization of marijuana, the access to broadband internet, zoning and building codes as it relates to the “tiny home” movement, as well as the flexible code enforcement that varies from town to town. The legislative panel addressed each issue and concern as it was expressed and informed everyone present as to what actions are being taken in Augusta regarding the subjects expressed. Rep. Patrick Corey (R-Windham and Sen. Bill Diamond (D)-District 26, reiterated that party politics play a very small role in their work together. 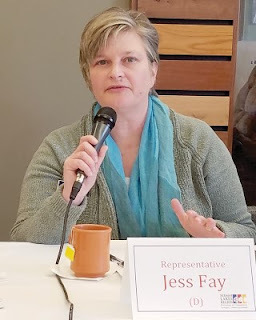 Rep Jessica Fay (D)-Raymond, Casco, Poland invited everyone to speak to their representatives. “Come to us and tell your story,” Fay said. The legislative panel included Phyllis Ginzler (R), Susan Austin (R), Mark Bryant (D), Patrick Corey (R), Dale Denno (D), Jessica Fay (D), Lester Ordway (R), and Bill Diamond (D). Ellie Espling (R) and Richard Cebra (R) were unable to attend due to a conflict. As for the legislative forum that occurred on Saturday, it seems it was viewed as a step in the right direction. “It’s always a good thing to get people in a room and start a conversation,” expressed Fran Monroe of the Community Economic Development in Gray. 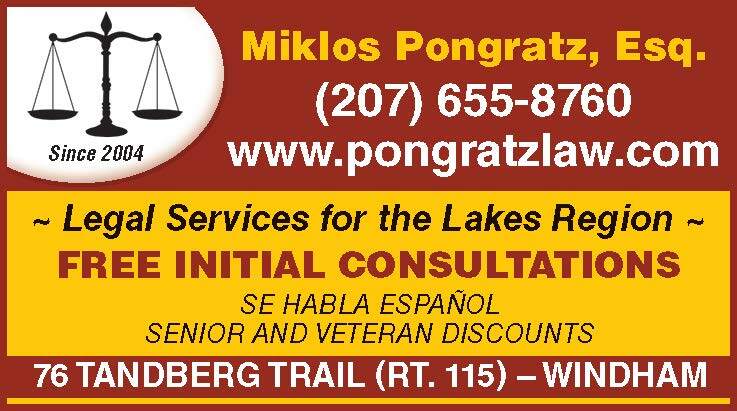 PowerServe Saturday - a morning of community service organized by Young Life Sebago, will be held on Saturday, May 13th. This is the second year for the community-wide event. Genevieve Delano, director of PowerServe and a junior at Windham High School, said that the event was initially planned as a one-time thing, but there were many requests that it happen again after last year’s event. “One hundred percent of the people we got survey results from, wanted to do it again,” she said. That was exciting for the committee of organizers, who started planning for this year’s event at the beginning of the school year. 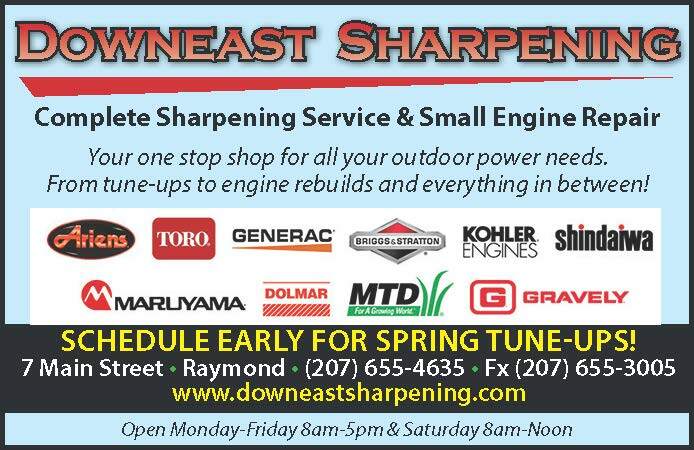 PowerServe has a main sponsor, Gorham Savings Bank, and the committee is currently reaching out to other potential sponsors. “We’re really excited to do it again,” Delano said. Last year, PowerServe was dedicated to Shane Donnelly, a classmate who passed away. This year, Delano said, the event is dedicated to the overall community and making that community better - but also acknowledge both Shane and another classmate, Kelly, who passed away when she was in fifth grade and would have been graduating with the senior class this year. “The senior class is doing a lot, with graduation especially, as a tribute to Shane and Kelly,” Delano said. The PowerServe committee wanted to do something similar in support of their families, moving negative energy and sadness into positive energy that can be used towards making the community better, she said. Participation last year was over and above what the committee expected, with close to 300 participants and 18 different projects completed. “We had a great turnout and everybody loved it,” Delano said. Last year, most projects took place on the school campus and included: Planting, gardening, building bridges on the cross country trail, and painting dugouts. 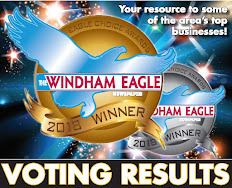 This year, similar projects are planned, but the group also hopes to expand projects, to have a wider impact in the communities of Windham, Raymond and Gorham, Delano said. One new project for this year is to partner with the police department in Windham to fix up the outside of the station, and do some planting in the K9 memorial garden, Delano said. Anyone with a project idea can contact the committee at: powerserve@yahoo.com. Projects might include yardwork for veterans or people who may need assistance, park clean up, and “Anything that people can tap into that we might have missed,” Delano said. The committee encourages people to register in advance if they plan to attend, so that teams can be organized, and people can be placed on a project that coincides with their skills and interests. Registration is free, and can be done online at: www.sebago.younglife.org. The first 250 registrants will receive a free t-shirt. The event begins at 8:30 a.m. and a complimentary lunch will be served at noon. Delano emphasized that PowerServe is a community service event, not a fundraiser. Sponsors support the event, but there is not an effort to raise funds, beyond what is needed to successfully complete the planned projects, provide t-shirts, and provide lunch. The flyer promoting the event succinctly described the overall goal with this statement: “Serving our community and each other is a powerful way to connect with others and find significance and joy in our own lives. By coming together as a community from all walks of life with many different skills and voices, we can make a difference. The Windham/Raymond Schools, RSU14, have announced the construction of a new playground space in order to improve safety and security at Raymond Elementary School (RES). Through a long-term application process with the U.S. Department of Defense, RSU #14 and RES are the recipients of the military’s Innovative Readiness Training (IRT) to help with the building of the playground space. The Maine National Guard will begin their two-week training, making many of the necessary improvements beginning in June of 2017. 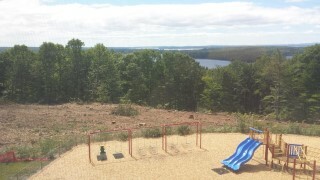 From the discovery of the needs of additional playground space to the present has been a six-year process. A preliminary design of a small ball field was developed in 2011 and this remained a concept until the fall of 2014 when a dedicated group of administrators, staff and parents began the process of change for the RES playground space. As a parent, Messer could have easily requested that a change be made and put all the work on an already over worked school and district staff. Messer became the change she wanted to see, working alongside school officials to make the needed safety and security modifications. With the support of the RSU #14 School Board and Superintendent Sanford Prince, Messer reached out to Eric Tarbox, Scout Executive/CEO of the Pine Tree Council of the Boy Scouts of America, which had recently been the recipient of the military’s IRT. “I asked Eric if he thought the playground improvement project would fit within the scope of the IRT.” Messer explained that she was grateful for Tarbox's advice and recognized he was of great assistance in the process for the RES playground IRT submission. Although Messer is a change maker, she calls attention to the fact she did not do this alone. In fact, other parents, teachers, administrators and even the students jumped on board to make the change happen. It was really important to Messer to have this be a team project. From the third grade student Oscar Horowitz, who designed the logo for the project with his Grandfather Rudy, to the now sixth grade students who helped in applying for a grant, the “Drive for Education Grant” established by Berlin City Auto. “Together, the students created a ‘Where’s Phil’ video skit highlighting the dangers of the playground and the need for ‘fill’ to even out the soil variations on the play field,” Messer said. 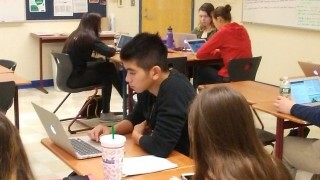 The video and grant proposal was submitted in the fall of 2015. The grant proposal was accepted and an award of $1,750 was received on December 8, 2015. Other funding sources include generous donations from a variety of local businesses. Community fundraisers have included working with local businesses such as the Good Life Market for holiday pies, ongoing Hannaford gift card sales, as well as continuing support from Pickle Ball Games at the RES. The Maine National Guard will begin the first phase of many towards the improvement of the playground and will make the RES their home for two weeks, sleeping in the gymnasiums and utilizing the Jordan-Small Middle School kitchen. Look for more information on the military drill in future communications. 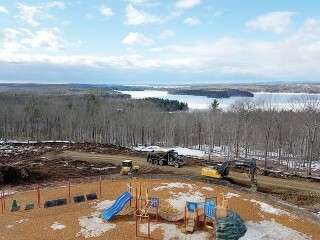 "I am so excited the Raymond Elementary School Playground Expansion is progressing for the students, staff and community,” Vice Principal Hutchinson stated. “I wish to publicly thank Alissa Messer for her commitment and dedication to this project. We would not have been able to accomplish this without her!" 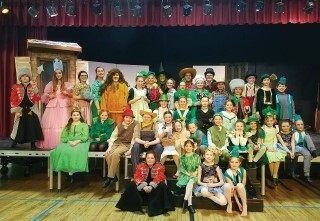 No one expresses those classic theatrical words of encouragement, “break-a-leg” to Olivia Elder who plays the leading role of Dorothy Gale in Windham Center Stage’s “Wizard of Oz”. She already did. Olivia, 13, had secured one of two cast roles of Dorothy and had learned her lines when she helped her brother clear snow from a high deck at their home. When they finished, both jumped off into the pile of snow. “He landed okay, but I hit where the snow was soft and my leg broke in two places,” she stated. It was just before the start of rehearsals for “The Wizard of Oz”, Young Performers Edition - when director Diane Hancock got the call from Olivia’s mom. “Oz, For Young Performers” is the adaptation of the classic 1939 musical drama about young Dorothy of Kansas who dreams of what’s over the rainbow. Her adventures begin when a twister carries her and her dog, Toto, off to see the wizard via the yellow brick road. In her dream world, she meets: Scarecrow (If I only had a brain), the Tinman (If I only had a heart), the Cowardly Lion (If I only had the nerve) and, of course, the Wicked Witch. “Oz” is performed by two separate casts (distinguished by cast A and cast B), each consisting of 40 young performers, ages 7 to 13. There are 12 performances on Fridays, Saturdays and Sundays from March 10 (Opening Night) to March 26. Annika Mocciola, who plays Dorothy in cast A, said she let out a scream of joy upon learning she had landed the leading role. The angelic voices of both Dorothy’s give a smooth and stirring rendition of the show’s famous, “Over the Rainbow”. 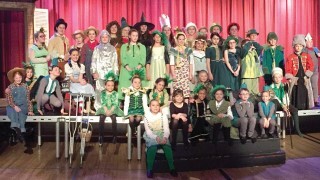 Dorothy and her friends are complemented by: The Munchkins, Trees, Winkies, Flying Monkeys, Ozians and more. “Oz” is a youthful blend of music and comedy set amidst the classic conflict of good and evil. “Oz” is directed by Diane Hancock with musical direction by Patrick Martin and choreography by Andrea Levinsky. And all the performances promise to “break-a-leg”.